When it comes to the the ultimate student experience, Montreal is at the top of the list. Quebec’s largest city received the highest score among Canadian cities in QS Top Universities’ rankings of the best student destinations for 2016. While Montreal was ranked seventh overall among all cities, Toronto and Vancouver tied for 13th spot. Ottawa and Quebec City landed at 49th and 55th, respectively. QS Top Universities examined cities with populations of over 250,000 and had at least two higher learning institutions. It then assessed them according to a variety of factors, such as the schools’ rankings, the cities’ affordability, the mix of students in each city, and its desirability as a destination. 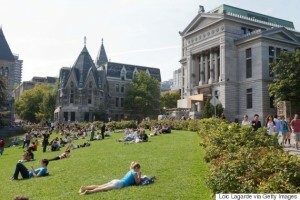 In recognizing Montreal, QS Top Universities cited its high-ranking schools such as McGill University, as well as the city’s status as a “cultural capital,” and its reputation as one of the most livable places in the world. Montreal’s overall ranking represented a step up from last year, when it was eighth. Kudos to Montreal for being such a great place for students!